Siargao Islands is a group of islands that boasts not only as surfing destination, but of pristine waters, lagoons, and protected landscape, and seascape. The mainland Siargao is one of the popular surfing destinations in the Philippines with a worldwide reputation for it’s thick, and hollow tube, or “Cloud 9”. Annually, a surfing domestic, and international surfing competition is held there. But not only is it a destination for surfers, it is also ideal for any type of vacationers, and travelers up for some good time in the beach, and salty waters. Here is a detailed Siargao Island how to get there, and transportation guide to get to, and around mainland Siargao Island. BY AIR: The fastest, and most convenient way to get to Siargao to take a flight from Cebu City to Sayak Airport at Del Carmen, Siargao. If you can not get a direct flight to Siargao, you can opt for a flight to Butuan City or Surigao City. BY SEA: Ferry departs daily from Cebu City to Surigao City at 7PM, except on Sundays. BY LAND: There is a 24 hour bus service from Cagayan de Oro, or Davao City via Butuan, or Surigao City. From Surigao City you can take a RoRo to Dapa Port, Siargao. There are available motorcycles to rent. There is only a slight difference on van transfer, and habal-habal rates from, and to the airport. Take the van transfer for convenience, and arrange it with the accommodation you’re staying at ahead of time. The locals are fairly accommodating to travelers and tourist. 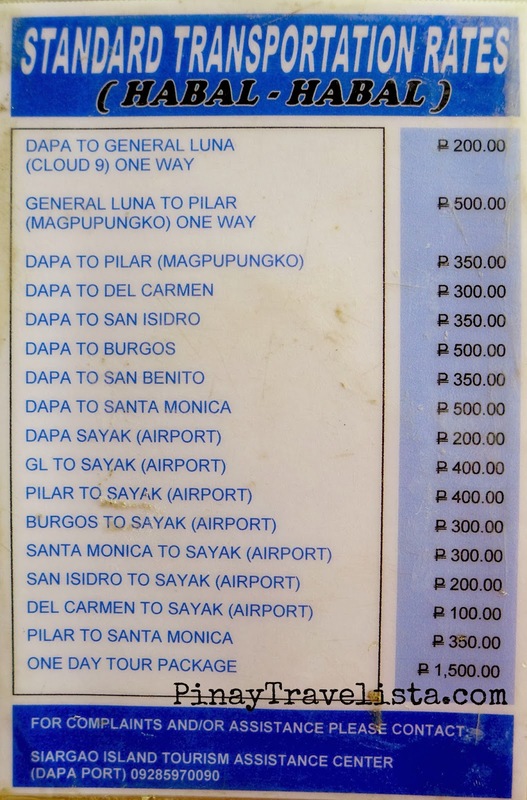 If you find lacking information from this Siargao Island how to get there, and transportation guide, I suggest that you ask your hotel/resort/host help you arrange transportation around the island. They will most likely have a list of trusted drivers, and locals they can recommend to their guest.